On Friday, August 26, 2005, visual artist Elizabeth Underwood made the decision to evacuate New Orleans when she learned that Hurricane Katrina had strengthened to a Category 3 storm in the Gulf of Mexico. “We knew this was it; this was the big one, the storm we’d been talking about for years,” she says now. For several weeks, Underwood “bounced around from couch to car to hotel,” ending up alone in Austin, TX, for nearly a year. Then finally, in August 2006, she formulated an idea for a project that would bring her back to her beloved city. In September 2006, she moved into an unheated trailer in the Uptown district of New Orleans and began laying the groundwork for “Art in Action,” turning to her art to help rebuild not only her own life but also that of her city, and joining a growing community of artists committed to doing the same. As the director of the “community-based, on-going, public art project,” Underwood orchestrates outdoor art installations in hurricane-devastated areas of New Orleans and uses the art to transcribe the experience of visiting those "tourist" areas as she guides visitors through some of the twenty-six sites created thus far. Underwood found inspiration for Art in Action in the work of artist Tyree Guyton, a fellow native of Detroit. For his Heidelberg Project, he transformed the vacant lots of a decentralized and marginalized district in Detroit into one giant art installation. Today, “though the neighbourhood no longer exists, you can go to the street where the art is still standing,” she explains. The heart of Underwood’s venture however originates in deep-seated New Orleans traditions. “This is a city that publicly ritualises life, death, and trauma through art, with examples in Mardi Gras and jazz funerals," she says. The jazz funeral stems from a centuries-old African ideology that has, in modern times, become a public, sacred experience unique to Louisiana, in which a jazz band plays slow, mournful dirges while the family of the deceased accompanies the body to the cemetery. After the burial, the band’s tempo accelerates, transforming the experience into a festive celebration that’s open to the public. This community-based act of sharing in another’s trauma finds echoes in the mission of Art in Action, whereby artists reanimate flood-damaged areas of the city by using them as the backdrops for their public installations, always with the utmost respect and care for the residents. Indeed, the artists can only produce their works with the permission and participation of the landowners and neighbours. Once the installation is up, participants invite the local community to an "opening" party complete with live music and donations from Whole Foods and the local coffee house Fairgrinds. In 2007, Underwood herself worked with fellow artist Naftali Rutter to create "Picture This" in the Lower 9th Ward. 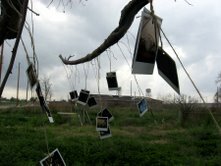 By hanging Polaroid images from the branches of a tree, the artists wanted to comment on how New Orleans has long been “visually fetishized” through photography. On the one hand, images recording the flood are powerful tools with which to communicate the need to rebuild the city and help its residents heal. On the other hand, “in a landscape that now symbolizes the horrific destructivness [sic] of marginialization/‘other-ing’,” it’s hard to find ways to “connect with the landscape/story via photography … with respect and dignity,” as they explain on the Art in Action blog. Picture This, however, also reflects how losing family photos became a shared experience for displaced residents after the storm: “A common refrain of survivors is how [that loss] is what hurts them to this day.” The site continues to evolve, since they invite anyone to add their own photos to the tree, as long as they’re "joyous, singing, and/or celebratory." In addition to support from the Joan Mitchell Foundation, Art in Action, like other initiatives trying to rebuild and renew the flood-damaged city through art, receives funding from the non-profit Art Council of New Orleans, the official art agency of the city. Even with its office destroyed and under water, the council became indispensable to the city’s art community after the hurricane. Shirley Corey, the CEO at the time of the flood, moved its headquarters some 450 kilometres northwest of New Orleans to Shreveport, LA, in order to field the calls that were streaming in, both asking for and offering help. One of the offers came from the French government and involved relocating artists to residencies in France. "Because of a long standing relationship with the French Consulate, the Art Council was prepared to work with them, and we were able to recommend a group of visual artists," says Mary Len Costa, Interim CEO of the council who worked with the consulate’s artistic attaché Debbie de la Houssaye to coordinate the residencies. "New Orleans is a city built on its arts and culture. It’s attractive to artists, with its laissez-faire attitude,” says Gene Meneray, the director of the Arts Business Program at the council. “It’s important for us to help them because a community looks to its artists to tell the stories and capture the thoughts and emotions after a tragedy to make sense of what’s happened." By funding "Social Dress New Orleans" (2007) by Takashi Horisaki, for example, the council has helped bring the story of the Katrina disaster to the Socrates Sculpture Park in Long Island City, NY, where the artist created a sculptural installation made of latex, cheesecloth, steel, and the remnants of a house that once stood at 1941 Caffin Avenue in the Lower 9th Ward. New Orleans has long identified itself in its artistic community, one with long-standing traditions of celebrating life and mourning death in very public, communal ways. While the population is still not back to its pre-Katrina numbers and many neighbourhoods remain in grave states of decay, the artists of New Orleans are returning to these traditions in order to tell the stories of the flood and ensure the city is reborn more vibrant than ever. Submitted by Darrel Ihm (not verified) on Tue, 2010-11-02 05:53.